Is There Something Neither the CDC nor Your Doctor is not Telling You About the Flu Shot? Disinformation, fear, and confusion is what the CDC, White House, FDA, and WHO have created in the great infection deception during the 2009-10 Swine flu "pandemic." And they are at it again! By proclamation, these groups continue to lie to us by telling us that we should all be getting our flu shots once again to prevent the disability and deaths from the influenza virus. For the most part, our good doctors and hospitals have swallowed these lies hook, line, and sinker. Nearly every hospital in the US requires that everyone working in the hospital either take the flu shot or wear a mask! 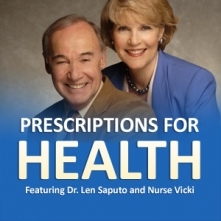 Dr. Len and nurse Vicki review the story that led to this serious misconception. Make no mistake, the influenza vaccine has NEVER been shown to save lives or prevent hospitalizations from the flu. It is amazing that year after year the CDC solemly swears that the vaccine is safe and works even though even the package insert for the vaccine states the opposite!